The Vancouver Fraser Port Authority owns and manages lands and waters, on behalf of the federal government, at the Port of Vancouver including Burrard Inlet, Roberts Bank and parts of the Fraser River. See the Vancouver Fraser Port Authority jurisdictional map. These lands are available for many different purposes – from major marine terminals to public recreation. Other parts of the Fraser River in Richmond, Vancouver, Delta and Burnaby are owned by the provincial government and managed by the Ministry of Forests, Lands and Natural Resource Operations. Permission to use and occupy port real estate can be obtained by contacting our Real Estate team. Tenure for public and recreational uses may be restricted to certain locations. The Canada Marine Act and our Letters Patent govern the types of uses that we can approve. length of term you will require the property and date of occupancy. Please note that the length of tenure term depends on the intended use, the property location and any planned upgrades to the property. special requests such as proximity to highways and railways, fencing, paved, etc. Select “add payee” in the bill payment section of your online banking site. Enter “Vancouver Fraser Port Authority” into the search field. Enter your six digit customer number (at the top right of your invoice) as the payee account. Verify the information provided and proceed. For more information, please contact us at 604.665.9145. In response to industrial land scarcity, we are advocating for the protection of the remaining supply of industrial land for future generations. The current inventory of industrial land is sufficient to meet demand for only about eight to 15 years. With one million more people expected in the region by 2041, we’ll need a secure industrial land base to support new investments and jobs. The cost of tenure will be determined based on prevailing market rates*. A fee to cover the cost of preparing the tenure documentation will be charged when the tenure is issued as well as any subsequent consents and amendments that you may require during the tenure term. Please refer to the current Port of Vancouver fee schedule for details. Other fees for permits to construct improvements may be required. * Please note rent is not included in the fee document. Please contact our Real Estate team for pricing. Learn more about project and building permits. 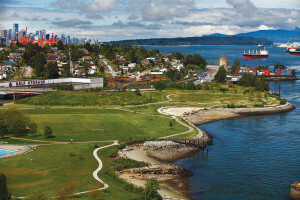 Permission to use waters at the Port of Vancouver may require the permission of the adjacent landowner, especially if your use will affect the landowner’s water access. Once tenure is issued, please be aware of certain obligations and responsibilities you may be required to carry out or deliver to the Vancouver Fraser Port Authority during the term. These include provisions for insurance, environmental assessments, survey plans and the port authority’s consent for construction within the premises. If your agreement with the Vancouver Fraser Port Authority requires you to conduct environmental testing, please refer to the Environmental Baseline and Exit Assessment Document for tenants. If your agreement with us requires you to obtain a legal survey, please refer to our Legal Survey Requirements Guidelines. If you have moved or company personnel has changed, please send us your updated contact information using the Tenant Contact Update Form below.